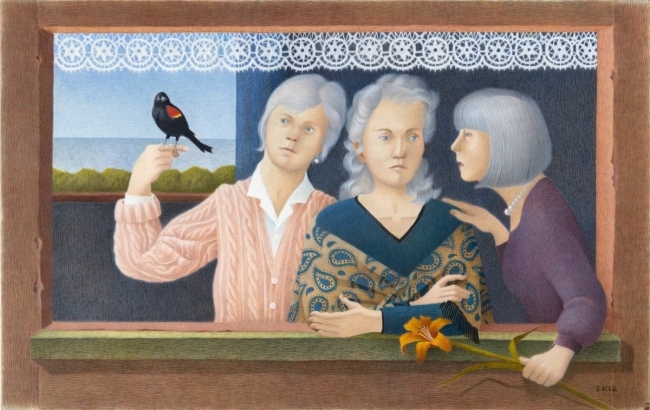 This painting pays homage to life-long friendship. The term "BFFs" was not part of our vocablulary when I met Jeanne (center) in 1960 and Janet (left) in 1971, but we certainly demonstrate its meaning. Jeanne and I met in Kindergarten at the River Plaza School; we both met Janet in high school in the early 70s and remain friends to this day. I punctuated the composition with the red winged blackbird and wild tiger lily, both of which proliferated in and around the saltmarshes that were our playground. I spent 5 months working on this painting--why not spend the time with friends?